THE Zvishavane derby between arch rivals Shabanie Mine and FC Platinum is a high stakes soccer match in the Premier Soccer League (PSL). However, this Saturday and with a prize money in the offing, the match promises to be a thriller as the Luke ‘Vahombe’ Masomere-coached side face off with the platinum miners in the final of the BancABC Sup8r match at Mandava Stadium in Zvishavane. All roads from Kandodo, Mandava, and Maglas townships will be leading to the epicentre of the Zvishavane derby. Soccer, being the town’s most popular sport, a full house is anticipated at Mandava fortress. Huge turnouts are witnessed each time the two soccer rivals clash. Over12 000 fans are expected to throng Mandava Stadium. It is the first time Shabanie Mine and FC Platinum meet in the final of the Sup8r. Shabanie beat fancied Dynamos 5-3 on penalties to secure a berth in the final while FC Platinum beat Monomotapa 3-1 in the semi-final to set the Zvishavane derby final of the Sup8r Cup. It was Tarisai Rukanda’s header that brought back the asbestos miners back into the game after trailing Dynamos for the greater part of the game. Midfielder, Russell Madamombe had put the Glamour boys into the lead before Rukanda’s equaliser. Masomere, who has not won a trophy at Shabanie will be looking forward to clinching the Sup8r Cup. The former Amazulu gaffer is expected to field a strong squad this Saturday and entrust his trusted lieutenants. Victor Twaliki who saved two penalties in the semi-final match against Dynamos could be the favourite shot stopper for tomorrow’s clash. EriaPhiri, Caleb Masocha, Pervington Zimunya and Valentine Ndaba are some of the regulars expected to be the pillars of the ‘Chinda Boys’ as Shabanie Mine are affectionately known. 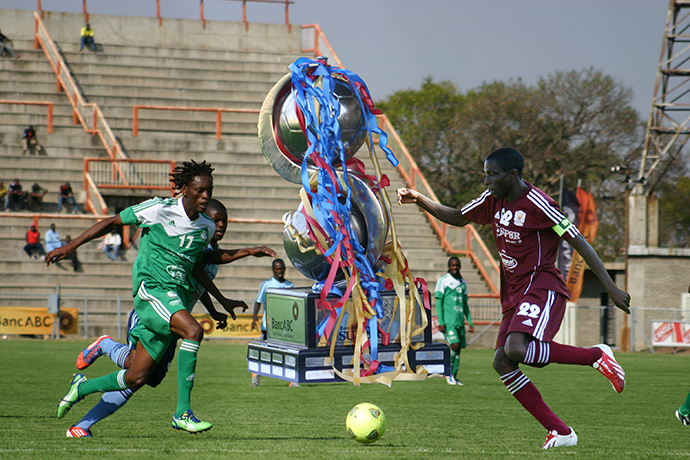 Shabanie have a never-die-spirit and that saw them equalising against Dynamos and eventually winning. Shabanie is a team of hardworking average players. On the other hand, FC Platinum who are in their third year in the PSL play in their second Cup final after the Bob 88 Super Cup. The platinum miners under the tutelage of Lloyd Mutasa are targeting their second silverware after the Bob 88 Super Cup. They came close to clinching their first silverware in 2011 when they finished the season on second position with equal number of points with Dynamos. Former Hwange goalkeeper, Petros Mhari could be the FC Platinum’s number one. Seasoned players like Charles Sibanda and Donald Ngoma are expected to lead the FC Platinum attack, while defender, Daniel Veremu provides the back cover. The match will present a good opportunity for former Shabanie Mine forward Nelson Maziwisa, who returned to FC Platinum to do what he knows best. He was last season’s PSL top goal scorer. Head-to-head statistics in the domestic premiership favour ‘Kugona Kunenge Kudada’ as FC Platinum are affectionately known. Of the five meetings in the premiership, FC Platinum have won twice in 2011 before they drew twice in 2012. The Chinda Boys have won once in the league match played on April 21 in the first leg of matches this year. The two will meet again in the second round match in Week 26 at Mandava. The BancABC final will be played over 90 minutes and in the event of a draw, there will be 30 minutes extra time. If the deadlock continues after extra time, a penalty lottery will decide the winner. Entry into Mandava Stadium will cost US$3 for the rest of the ground, while the VIP section is pegged at US$10. The VVIP enclosure will be strictly by invitation. Winners will pocket US$120 000 while the runners up will be US$50 000 richer.